Anemos View is a self contained apartment situated in a quiet area of Firostefani and just a few minutes walk from Fira town with its shops, resyaurants, museums and lively night life. We are a couple of minutes walk from Firostefani's shops, restaurants, the bus stop and breathtaking views of the caldera and the famous blue domes. There is a beautiful view from the apartment, which is situated next to the castle, across the island to the sea, and even to Crete on a clear day. 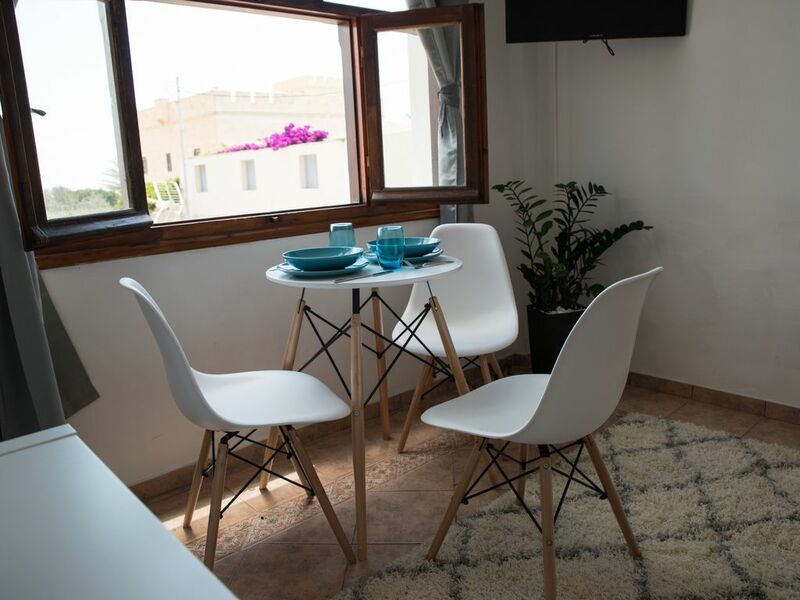 The apartment consists of 2 rooms and a loft bedroom as well as a spacious bathroom and a kitchenette, equipped with a microwave oven, a kettle, a coffee machine and a toaster. There is a shared garden with seating. We are family friendly and can provide some baby equipment, including a baby cot, free of charge. Anemos View is located in a quiet area of Firostefani village with tavernas, shops and the bus stop just a 2 minute walk away. Fira town is a 5-10 minute walk with museums, shops, restaurants and a lively nightlife. There are spectacular views from the apartment. We can arrange boat trips to the volcano, hot springs as well as fishing, cliff diving and photography boat trips. We can also arrange guided tours and car rental. We are family friendly and can provide some baby equipment free on request. Quaint, clean and perfectly located. If you are going to Santorini, this is the place to stay! Close to everything in Fira, by close I mean a 10 minute walk at most. Quiet and relaxing. 30 second walk to a beautiful view of the caldera at sunset. Annie was fantastic. She Arranged transportation, answered all our curious American questions about Greece and the island, printed our boarding passes saving us over an hour of hassle and potentially €110 at Ryanair, and even brought us fresh Strawberries. 10/10 all around. Thank you. I hope you've has a great time in Athens. The apartment was just what we needed for our family of 4 during this amazing trip. We felt at home. We were close to town, bus station, many shops and restaurants, walks with amazing views. Sun sets were also amazing. Annie the owner was very responsive and attentive to our needs. This was the best trip yet! Thanks! Thank you. Enjoy the rest of your holiday. The apartment is in a really good position, it's in perfect conditions as in the pictures, very clean. The remarkable point of this apartment is the window with an amazing view. The owner Annie is very kind and very well organized to help the tourists when needed. Thank you. I'm happy that you enjoyed your stay with us and look forward to seeing you again if you visit Santorini in the future.